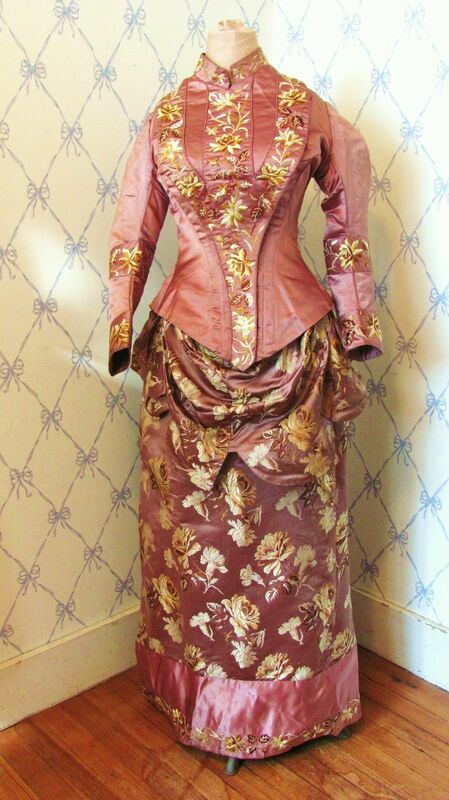 This is a stunning example of a high quality 1880's Victorian 2 piece gown made in Paris by Elisa Mery who had a shop at 48 Rue Caumartin. 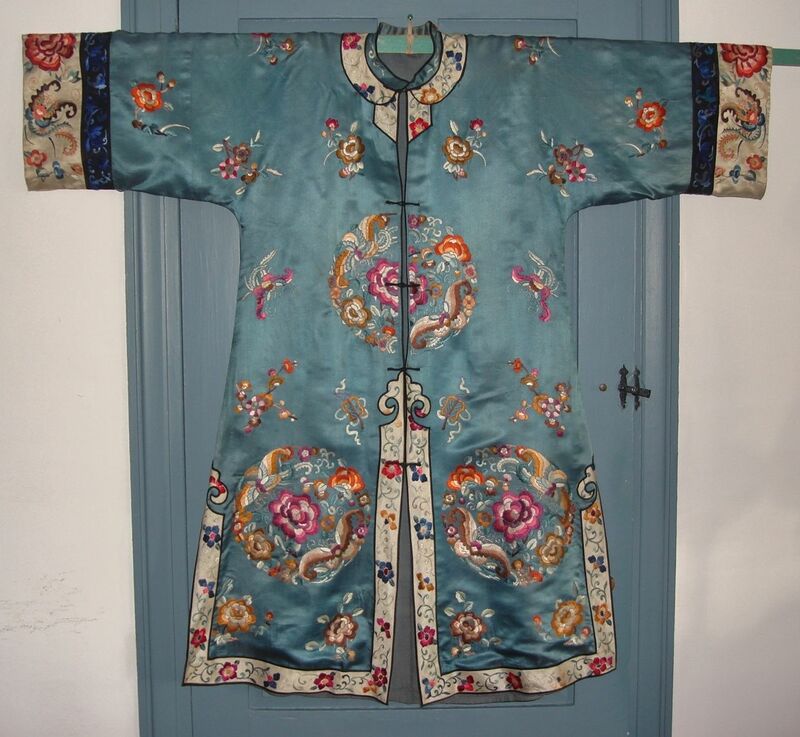 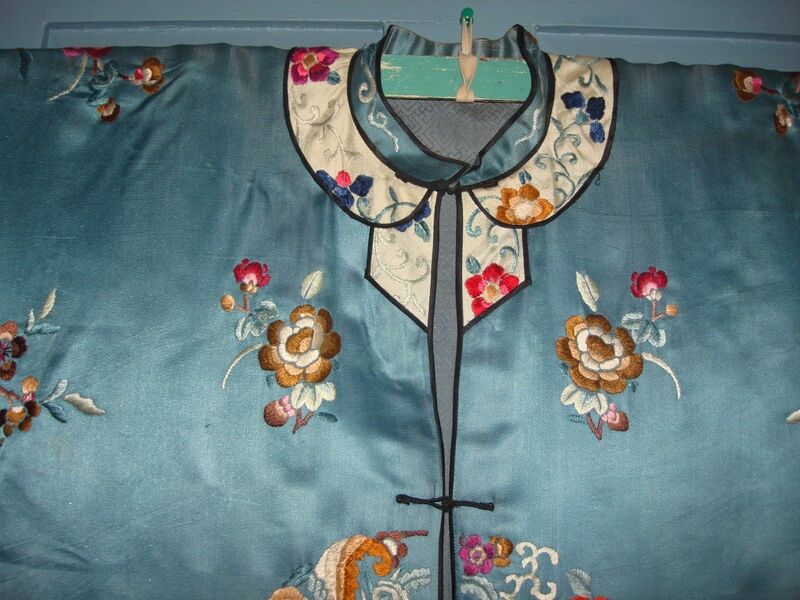 It has exquisite workmanship and fascinating details. 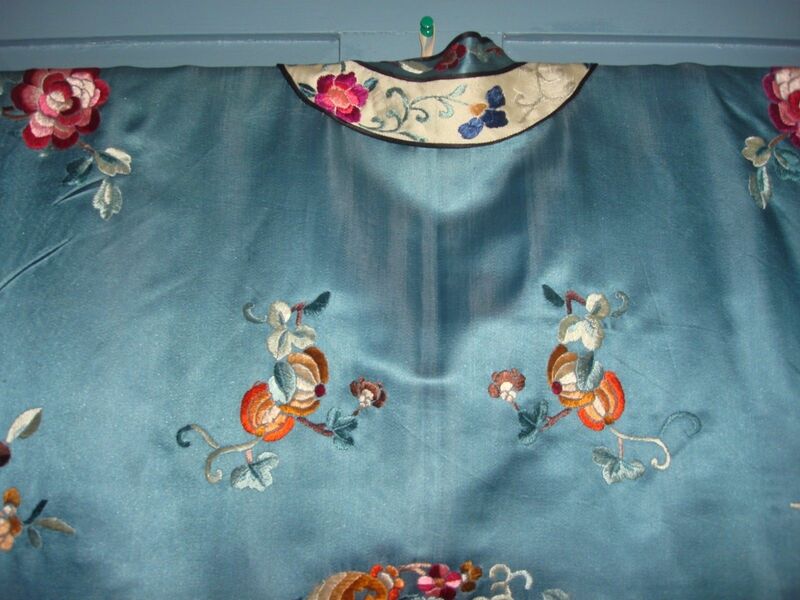 The fabric is of superb quality and in super condition. 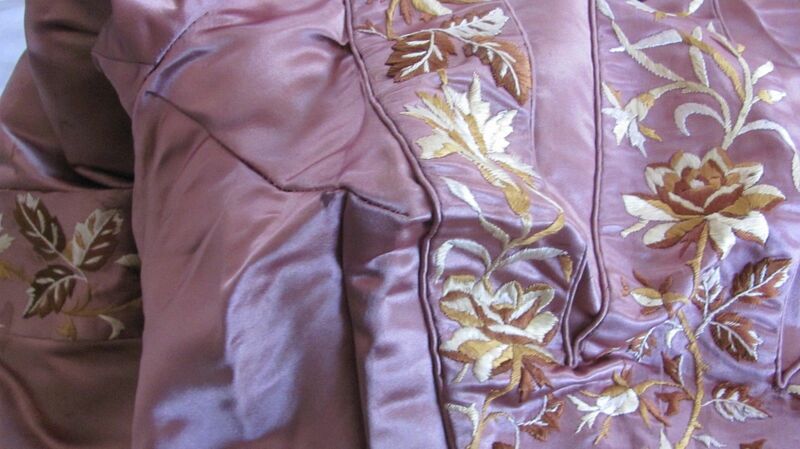 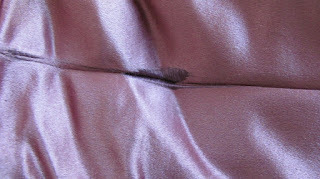 The jacket and band on the hem of the skirt are made of a lusciously rich lilac silk satin. 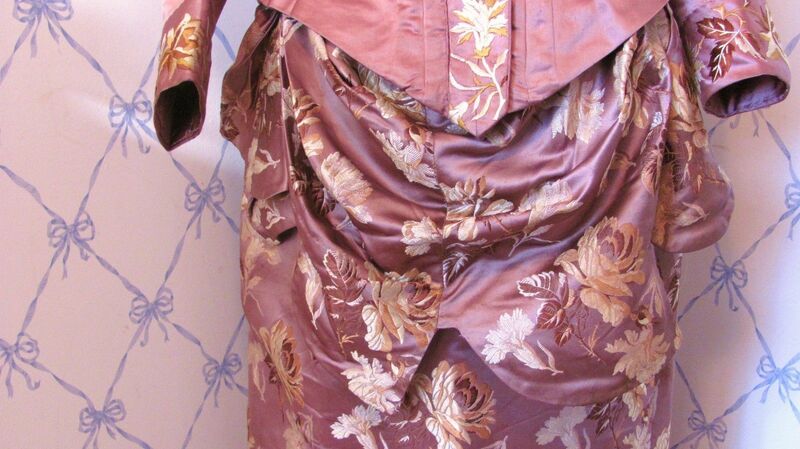 The skirt and draping is made out of a coordinating lilac silk brocade accented with a floral design in shades of cream, brown and gold. 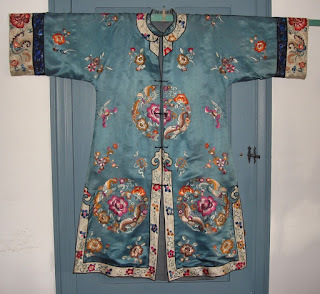 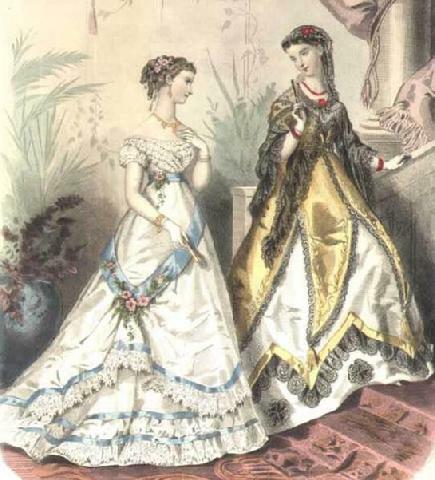 The sleeves and bodice are accented with bands of hand-embroidered flowers and leaves in the same colors as the brocade pattern. 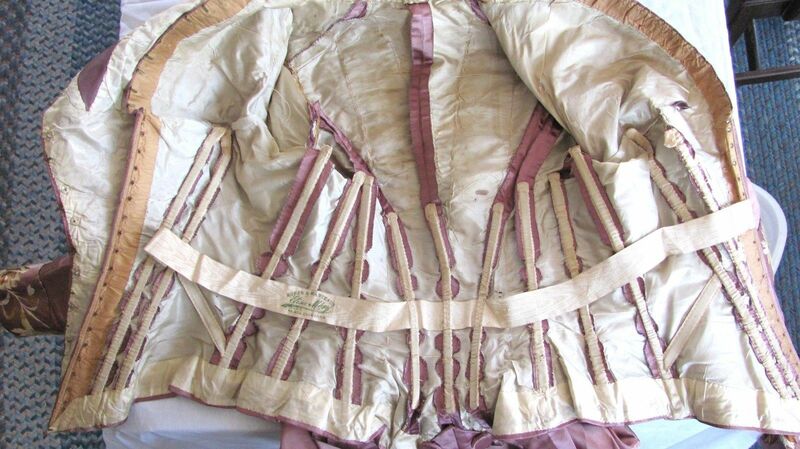 The interior of the bodice shows the high-quality workmanship that went into creating this spectacular gown: myriad bones, hand-cast seams, fabric covered weights at the center back hem, tiny, handsewn eyelets and thread loops. The poor rich lady who wore this must have looked amazing but it couldn't have been comfortable. All those bones would have kept her from slumping, slouching, bending and probably breathing and the corseted front insured she didn't get in or out of this quickly. 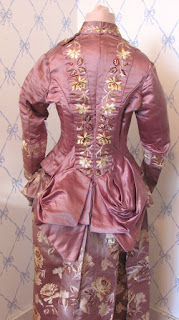 I just love the draping and pleated accent on the back of the skirt. A classic design of this era. 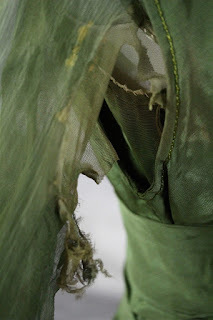 The draping was lined with a wool challis and I guess the moths enjoyed a snack here and there. Happily they left the silk intact. 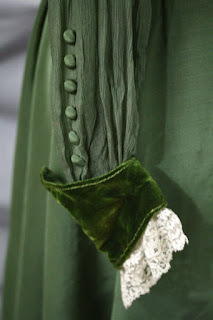 The garment is in fabulous condition considering its age, but there are a few spots, slight staining under the arms as well as a few scattered pulls in the fabric. The hem is soiled--as one would expect--and the length may have been altered at some time because the hand stitching is done in red thread. 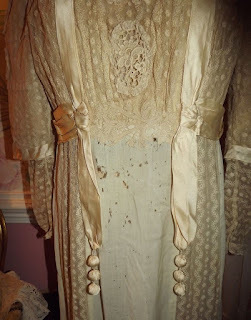 Luckily this doesn't show on the outside. 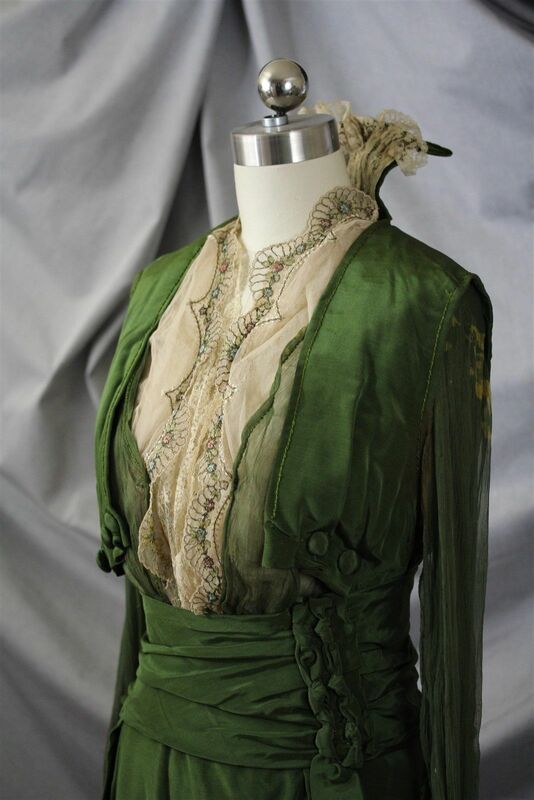 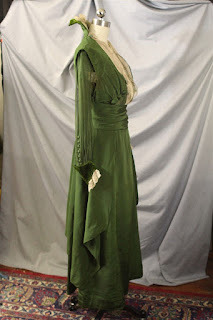 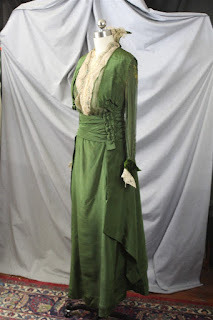 Happily, the gown is in wearable condition and unlike the majority of women from this era, the owner was a substantially built woman, particularly in the bust area. 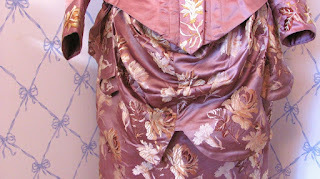 Bust: 42" Waist: 28" The hip area is ample since the skirt is pleated. Length from Waist to hem: 41"
A fabulous garment like this doesn't come up for sale often. 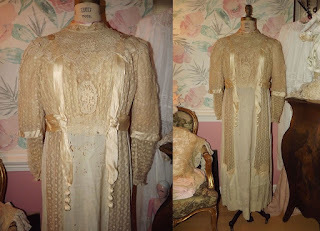 Make this the newest addition to your antique clothing collection. 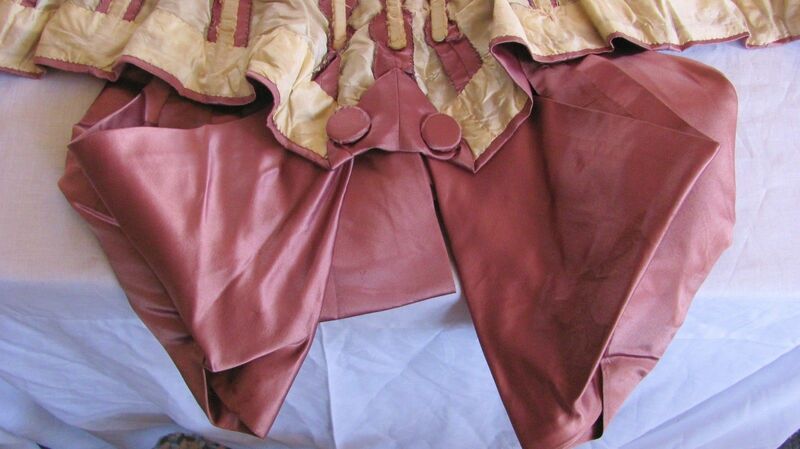 Anyway, at first blush, I thought this was a costume. 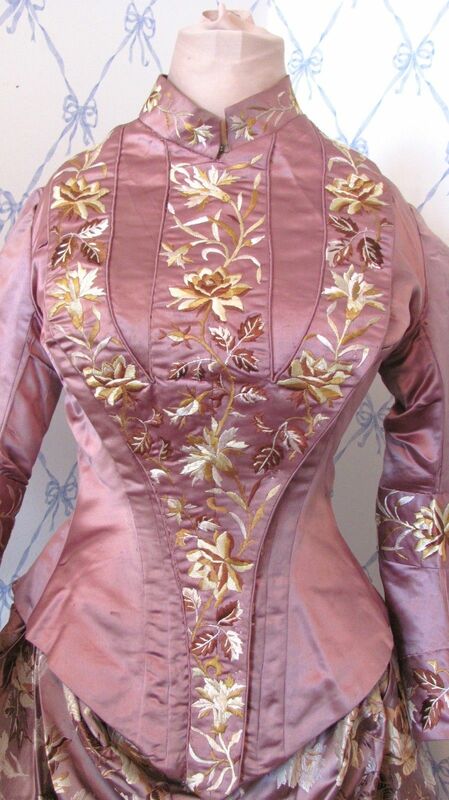 The embroidery and the materials look pretty modern. 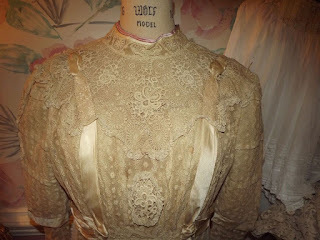 However, look at the inside. 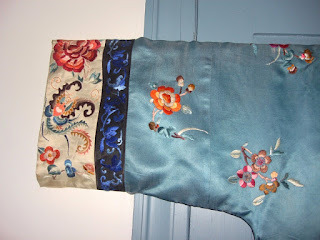 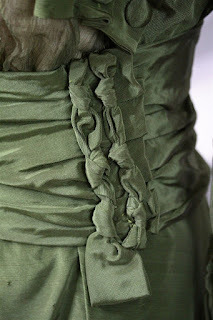 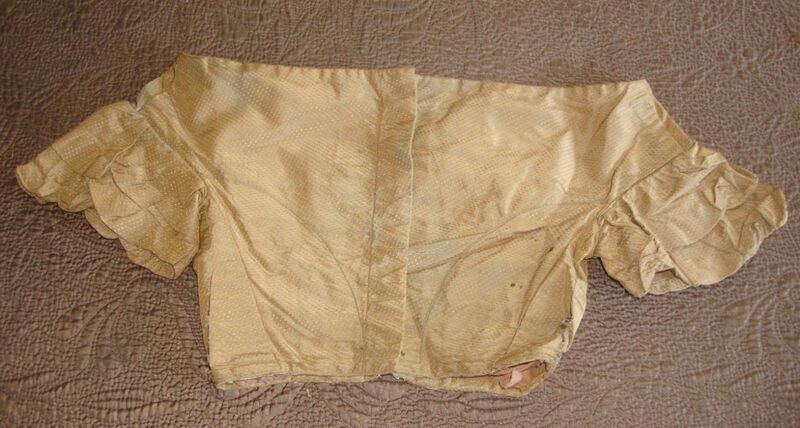 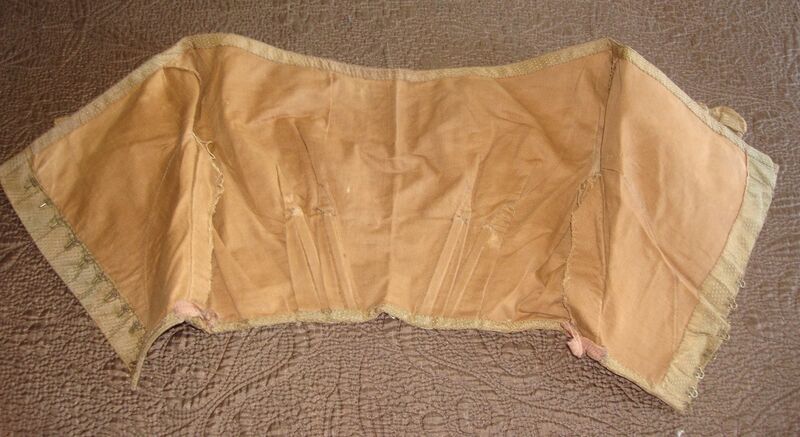 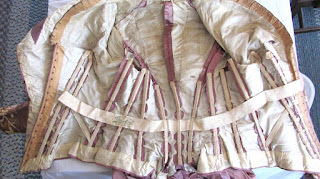 Not only does it still have the waist belt, the way the fabric is cut is very Victorian in nature. 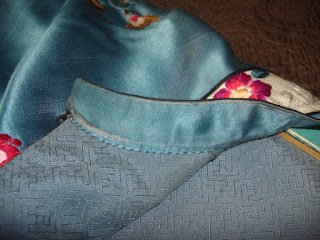 Notice the rounded, finished seams? 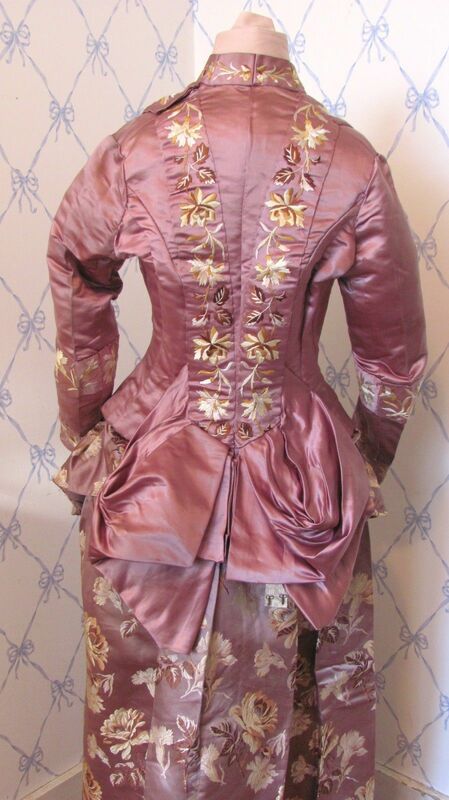 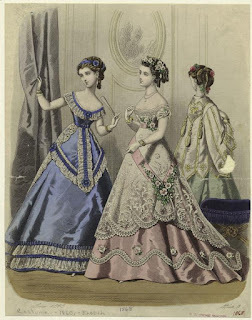 Given the length of the bodice and the narrowness of the skirt, this is late 1870's. 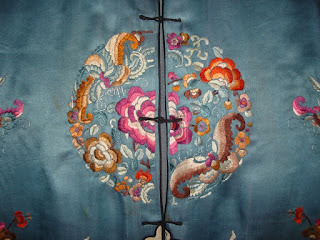 Happy New Year's Eve everyone!!!! 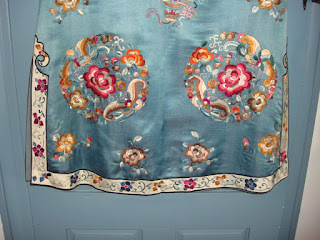 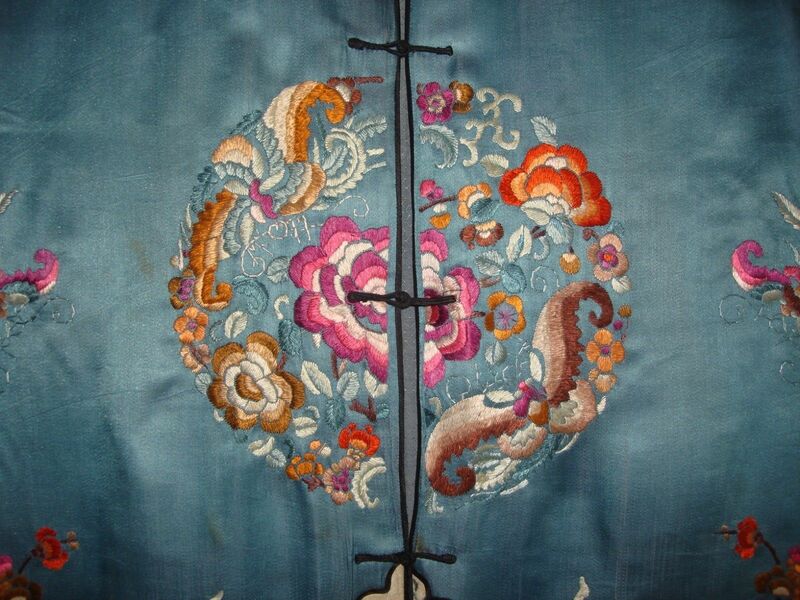 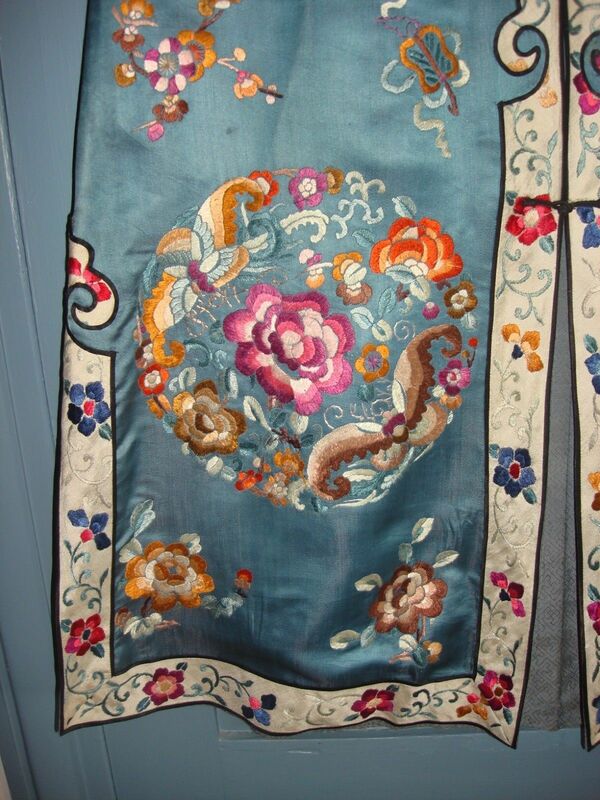 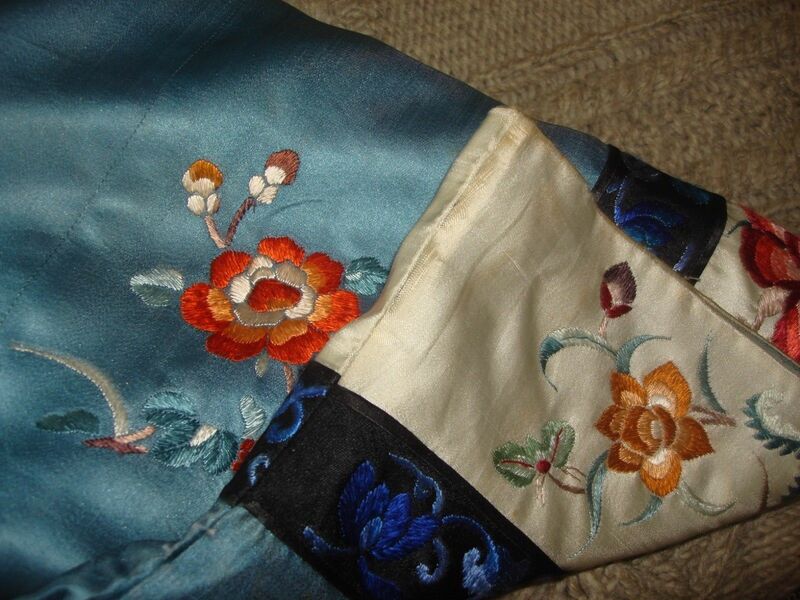 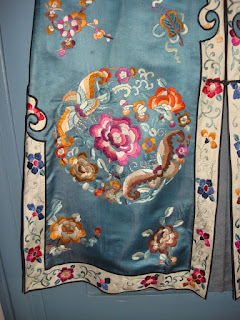 It is embroidered with creatures and flowers in many areas(please see photos). It measures 45" long and about 42" around in the underarm area. Closure is with black frogs down the front, and it is lined with blue silk. 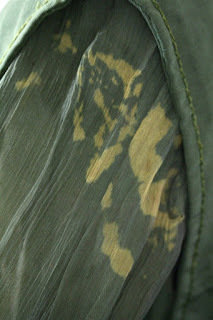 Condition is very good. 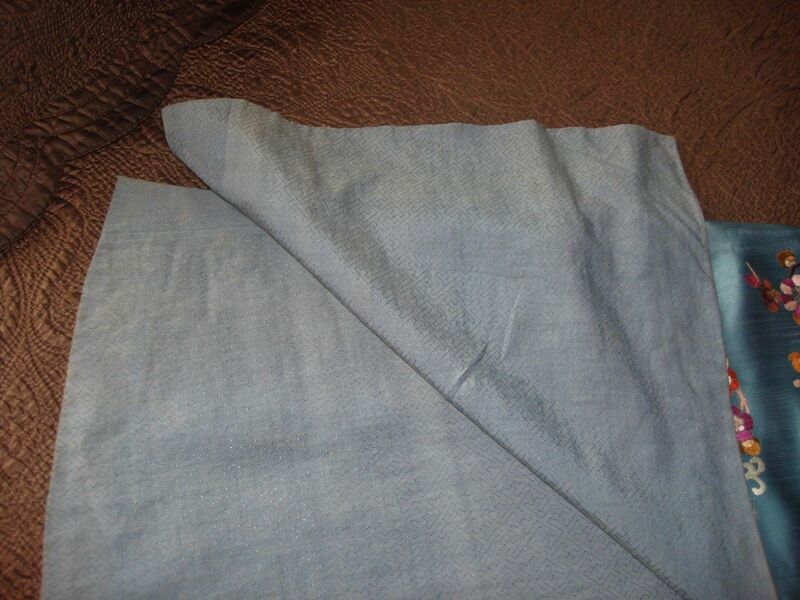 There is slight wear along the edges of the cuffs, and around the neck. 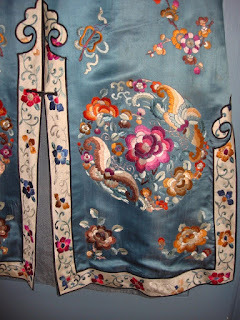 The lining is faded in places as well. 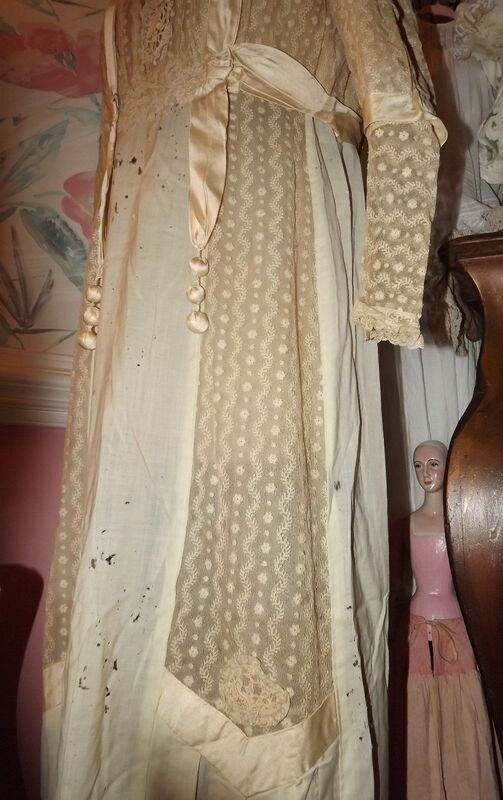 Estate found here in Maine, offered with no reserve. 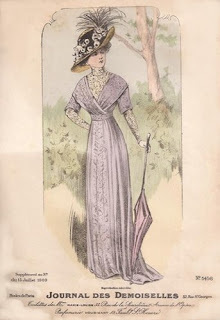 I know this is before the 1920's only because by the time you hit the 1920's in China, you see a lot of change in fashion. 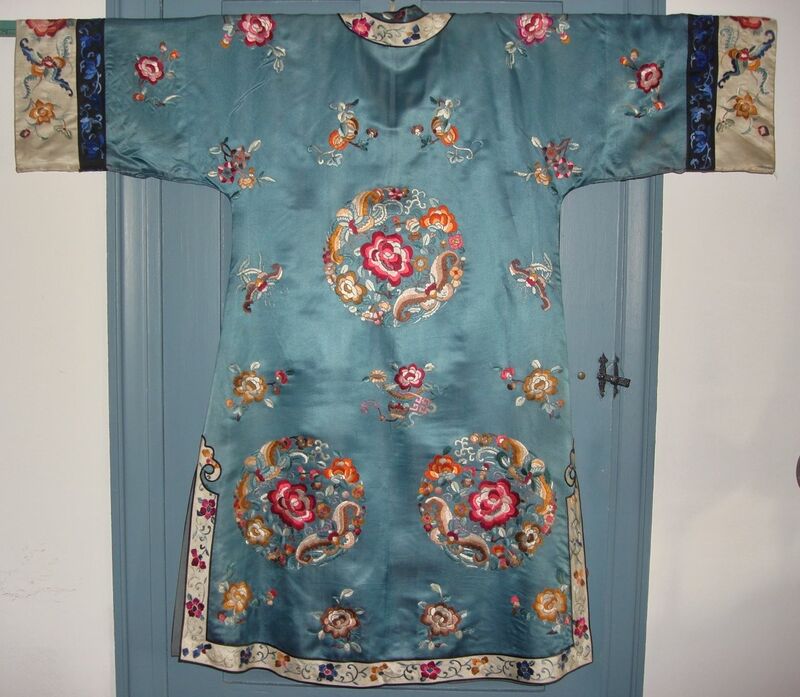 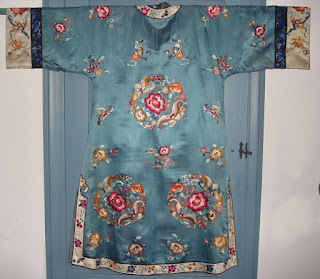 The Cheongsam dress that most westerners are probably familiar with comes into play in the 1920's. Based on the other examples I found, I'm favoring the late 19th Century. 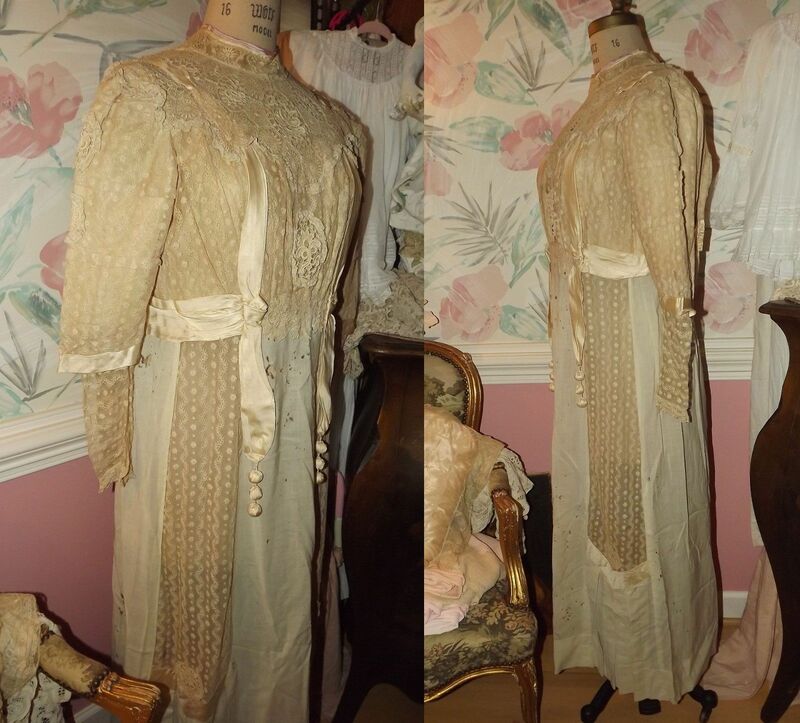 One report I read suggested these were sold to Westerners in the 1920's as cast offs - most of the robes were from the 1880's to about 1910. This, of course, makes sense. And, if you are like me and love some good costuming (this has a mix of historical and fantasy) check out this page. 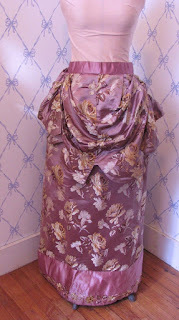 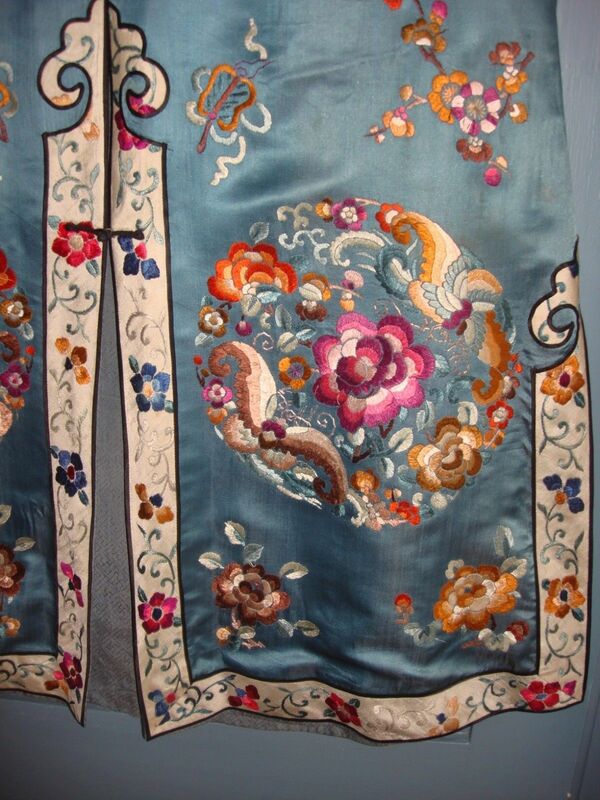 We have several Antique / Vintage Ladies Dresses we will be Listing, hopefully we will get them in the proper Category! 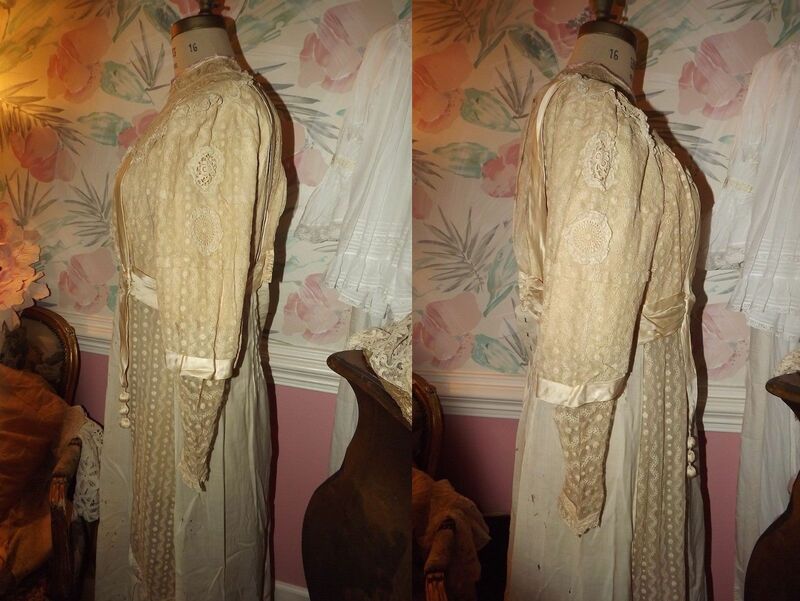 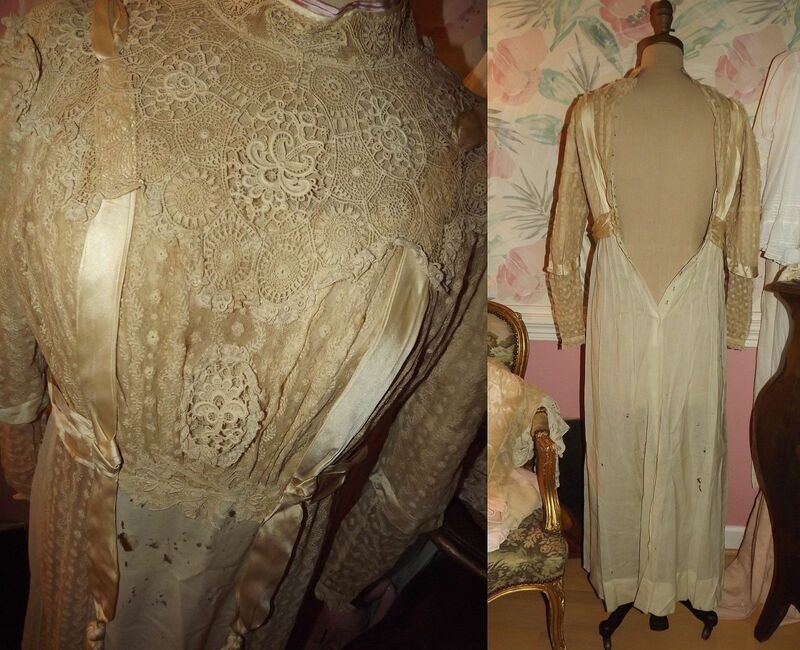 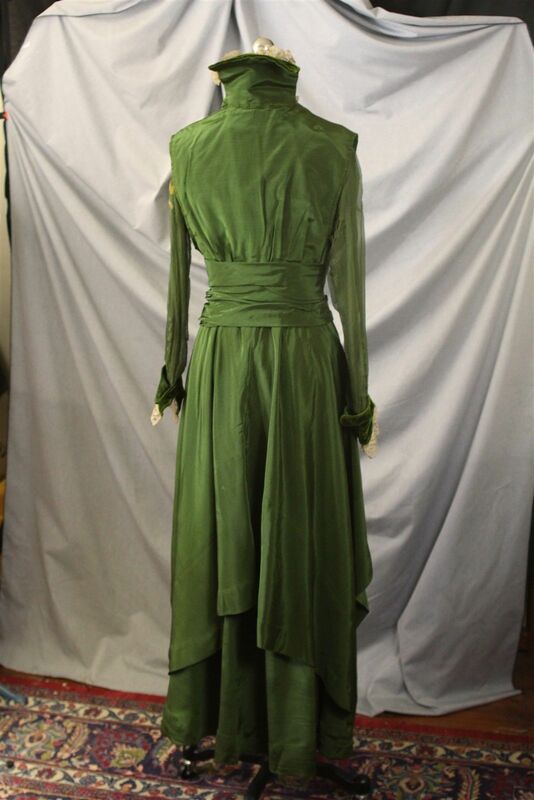 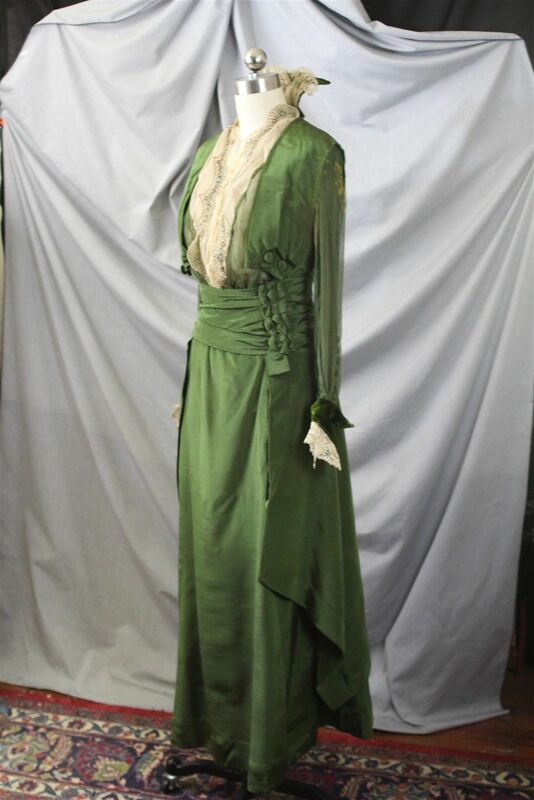 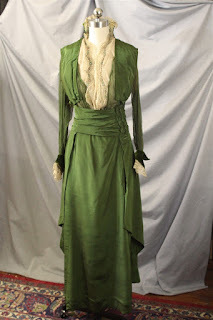 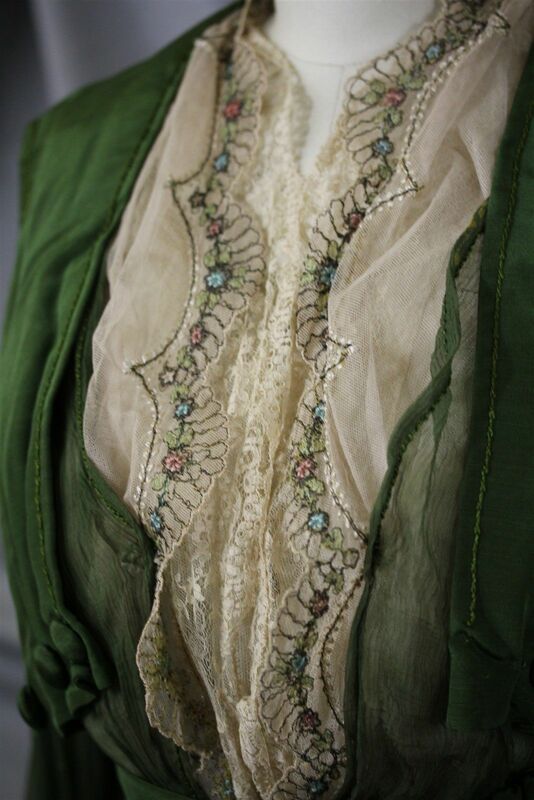 Antique Ladies Dress, we believe this one to be from the Victorian/Edwardian Era. Will have to say this one is for Study or Repurpose as the main fabric of the dress is deteriorating, however there is a ton of lace that is good for salvage, it is quite musty though, so you may want to give the lace an airing before use. 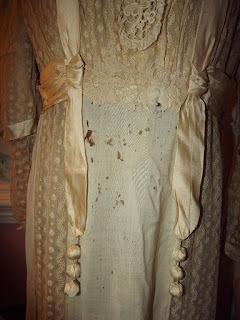 Can't find any major damage to all the lace, perhaps one or two small holes or a light stain or two. 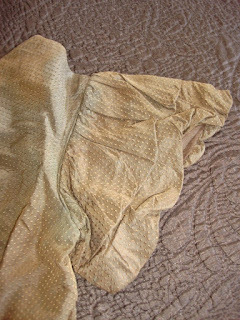 Did a slight tug test in a few places, seems to be good, imagine if you tugged hard enough it would rip. 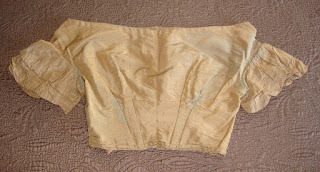 Would say it is a small to a small medium. 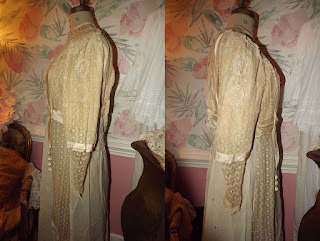 It has a ton of ecru embroidered net lace on the front, back, sleeves and down the sides, the back has pintucks of the embroidered lace, gorgeous lace at the chest with matching lace appliques down further, on the sleeves, and the sides as well, luv the ribbon bobbles on this one !!! 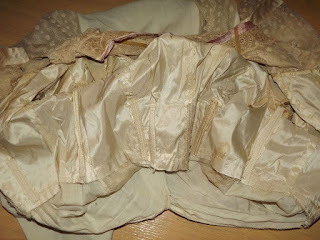 All the ribbon is in pretty good shape too, a couple of holes where it meets in the back at the waist. On the inside chest area there is a piece of netting all is attached too, it has a little bit of staining to it. 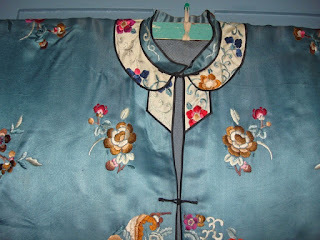 Also a plastic type boning at the neck, see photo. The inside fabric is deteriorating as well, there is boning and lots of hook &eye closures from it for use as well. 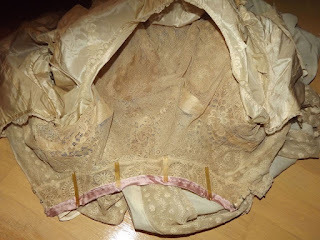 Also an organza type fabric behind the lace on the side panels, some of it may be useable as well. This is either a UFO or someone ripped the satin of the skirt off years later. 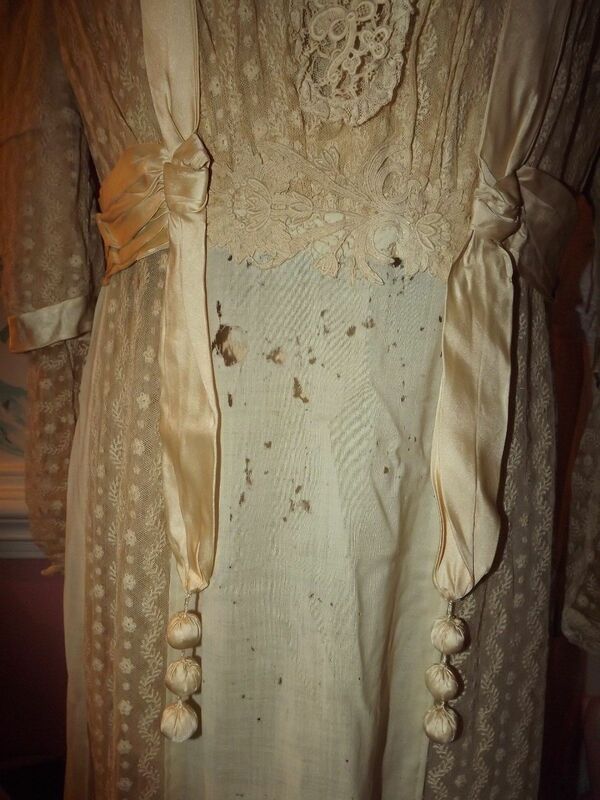 The cotton wasn't ever meant to be seen. 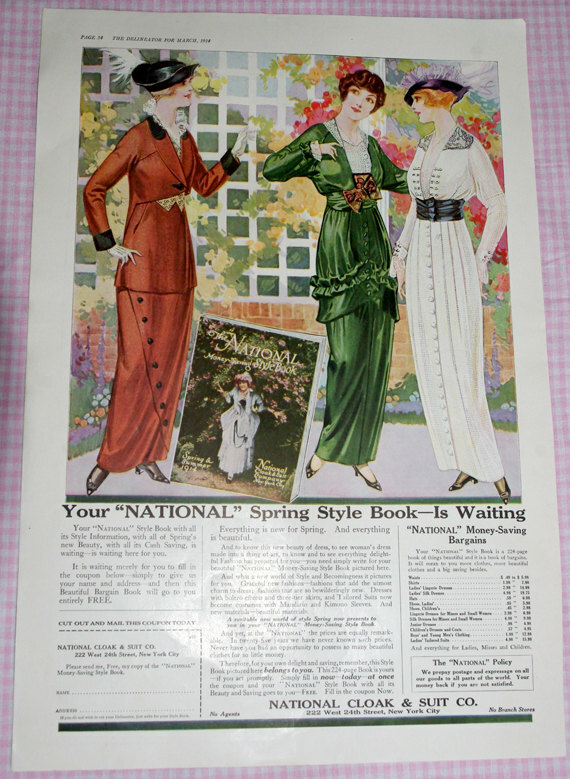 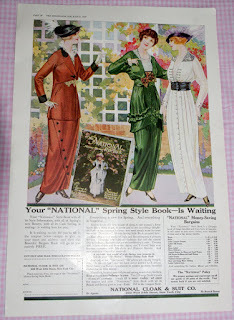 The double sleeve gives away the age as well as the height of the waistline - late Edwardian about 1909 ish. 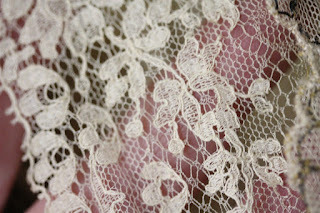 All hand stitched of course, made for a tiny woman or girl. Color is a bit deeper brown than my camera shows. 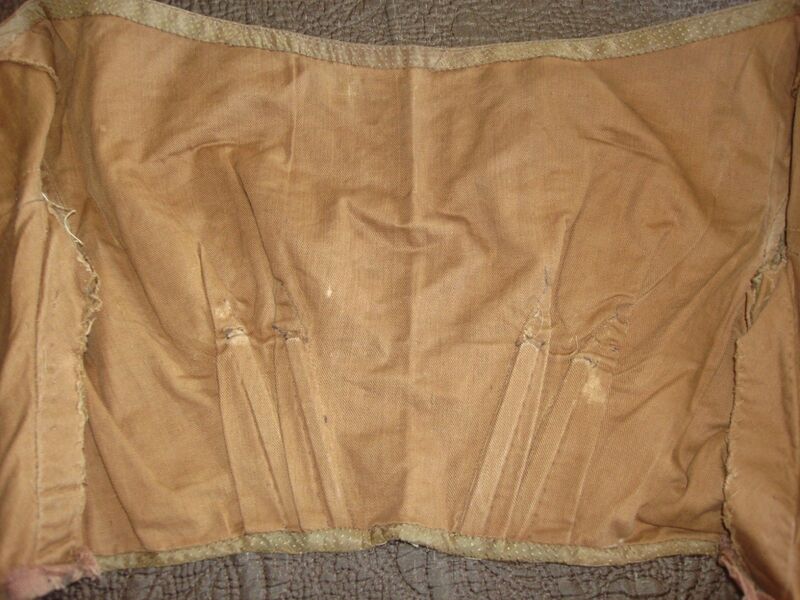 Measures about 11" long, and has a 21" waist, and a 28" bust. 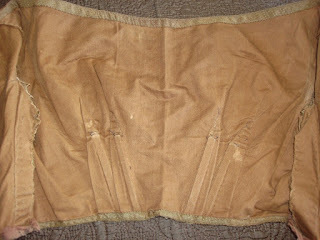 Brown silk with a raised overall nub pattern, all lined with brown cotton, 4 bones, and brass hook and eye back closure. 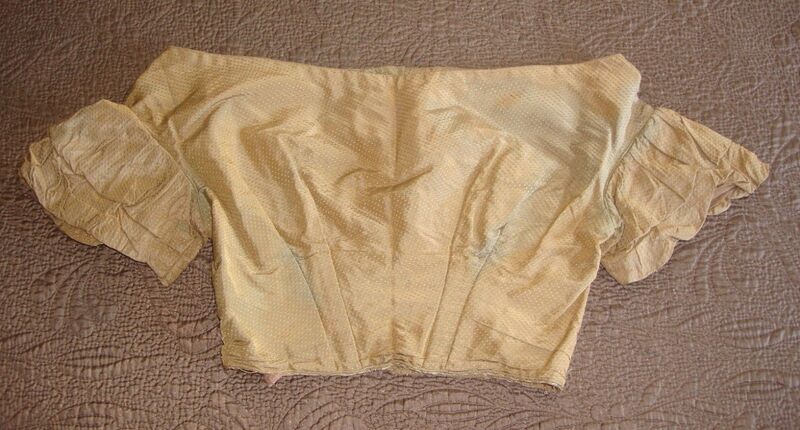 Overall good condition for its age, some seam wear, couple of small holes, probably a bit of fading although not bad. 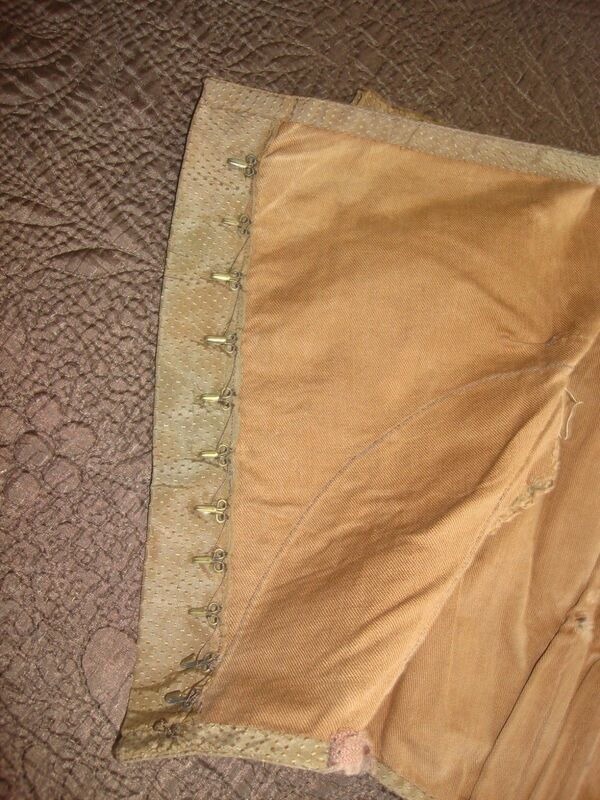 My guess is this is a ballgown bodice around 1868 when the bodices got high up and tiny. 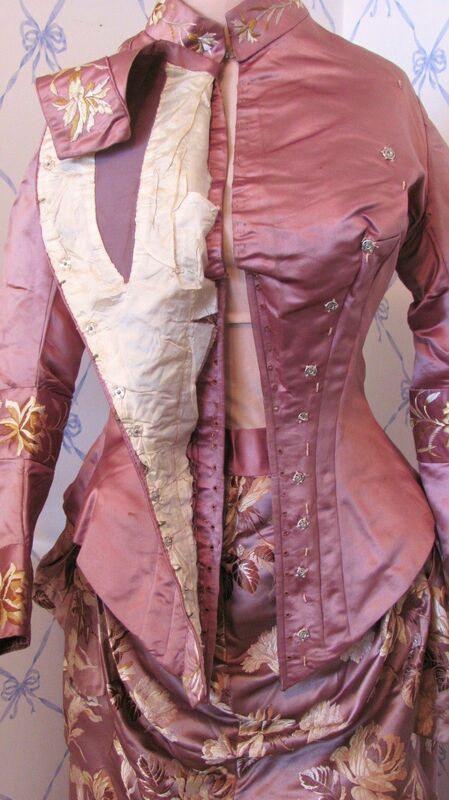 It looks like it has machine sewing (hard to tell though) and the double darts are more associated with the early bustle era than the 1840's. Although you don't see the double darts in the evening bodice of this dress you do in the day bodice. Shoulder from sleeve to sleeve: 15"
Length from collar to waist: 14"
Overall fabulous dress well worth the effort of restoring underarm damage. 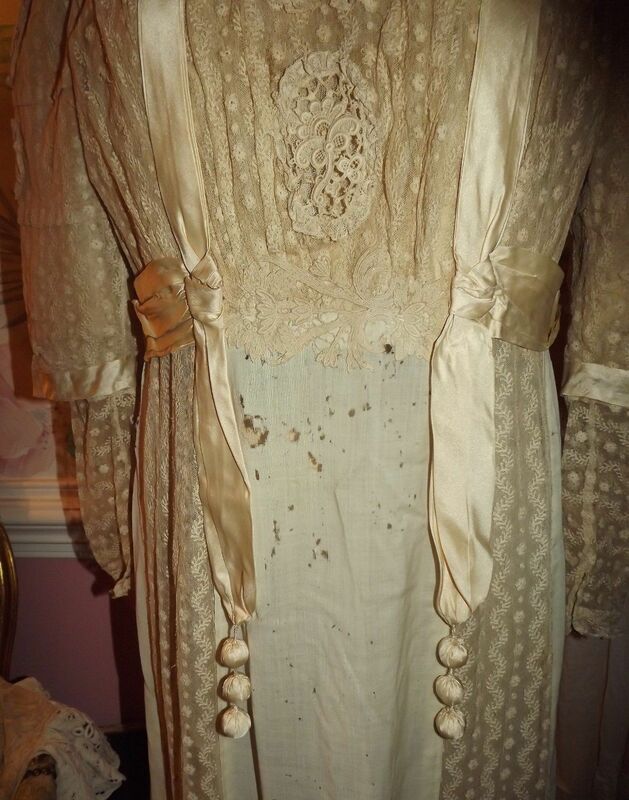 Very good condition with the following exceptions. 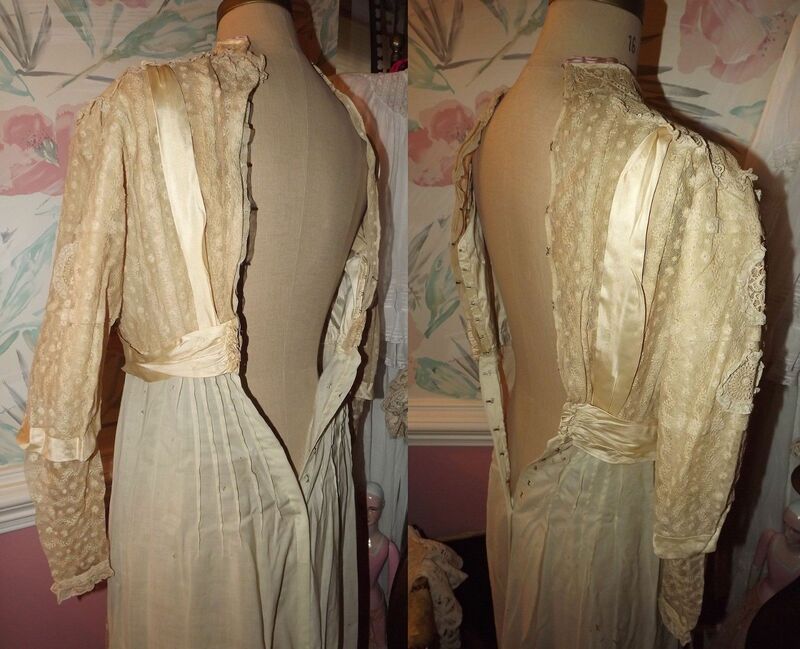 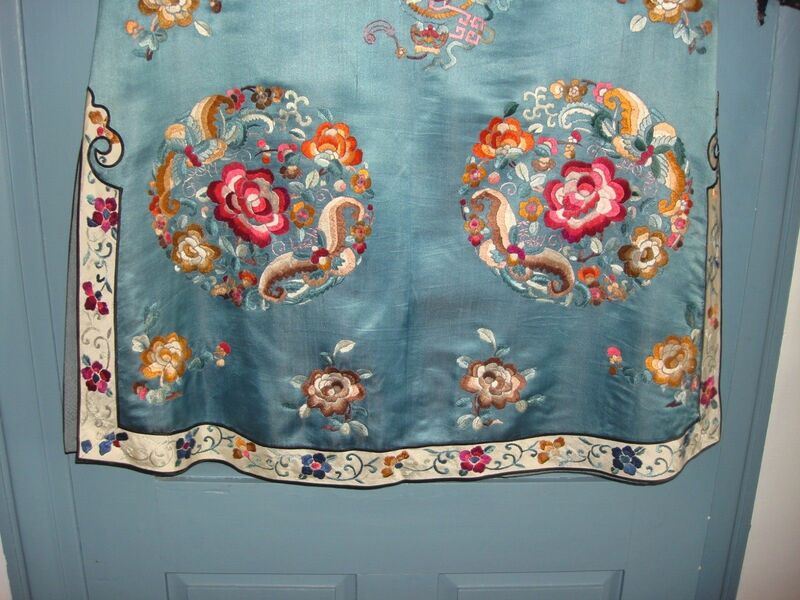 Chiffon at underarm has disintegrated and/or is discolored, interior silk knit lining on sleeves also shows splitting. Very 1914 and a lovely dress. 1840's dress remade in the 1860's Stripes!